Welcoming the Supreme Master Ching Hai who came to the United States to accept a Commendation, at the grand greet-Waikiki Hotel, Honolulu on 25th October, 1993 at 6:30 p.m. This party was held by Mayor Fasi of Honolulu, and Mr. Chen Hung Kwang, Chief Secretary of the World Cultural Communication Association. On behalf of the United States government, Mr. Fasi, Mayor of Honolulu awarded the International Peace Commendation, and the Honorary Citizenship to the Supreme Master Ching Hai from Formosa. He also announced the 25th day of October as the "Day Of The Supreme Master Ching Hai". This is to recognize Her Contribution in promoting the peace of the world, and the exchange of civilian friendship. Mayor Frank F. Fasi of Honolulu awards a certificate of "Honorary Citizenship" to the Supreme Master Ching Hai. After the great floods in the Midwest of the States, believing that others' agony is our agony too, the Supreme Master Ching Hai Initiated a relieving donation for the States of Missouri, Iowa, Illinois, Wisconsin and Louisiana amounting to a hundred thousand U.S. dollars. The Supreme Master Ching Hai explained that this amount was donated by the fellow practitioners in the States (mainly former Aulac refugees), supplemented by seventy thousand dollars from the fellow practitioners in Formosa. 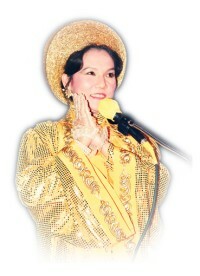 The Supreme Master Ching Hai also expressed that She would donate a million dollars to the United States Government to help relieving the flood disaster, and the veteran, medical research against AIDS and cancer, the leprosy hospital on the Molokai island, and the homeless in Hawaii, etc. The Supreme Master Ching Hai had also organized relief to different countries around the world in the past. Alone in Philippines, She and disciples donated the Pinatubo victims about US$ 2 millions (2,000,000 US$). (just as this news articles to be published, the Supreme Master Ching Hai has arrived in Los Angeles, and is preparing to donate two hundred thousand dollars for the recent fire disaster in Los Angeles.) Her sincere actions in adversities, and Her contribution in promoting the cultural communication between the East and West are the chief causes of Her award and Honorary Citizenship.